Australia's ban on Huawei shows business can still be done with the emerging superpower, Australia's High Commissioner to Britain, George Brandis has told an audience in London. The U.S. dollar remains the world’s reserve currency—for now. However, a number of central banks lately are contemplating a world in which the almighty buck isn’t the pre-eminent global medium of exchange. Half of international trade was meanwhile invoiced in U.S. dollars, even though the U.S. share of international trade was only some 10%, Carney added. The central banker said the Chinese yuan USDCNY, -0.0015% USDCNH, -0.0577% could be an alternative. However, he cautioned that such transitions wouldn’t happen overnight. “The U.S. economy overtook Britain’s in the second half of the 19th century, but it took until the 1902s before it became a dominant currency in international trade,” Carney added. Elsewhere, Russian news service RT on Thursday reported that Moscow shifted $100 billion of its reserves into Chinese yuan, Japanese yen and euros to diversify away from the U.S. dollar. This follows comments by Russian President Vladimir Putin in late November when he said that it wasn’t Russia that wanted to move away from the dollar, but that the dollar was moving away from Russia, in relation to U.S.-imposed sanctions. BRUSSELS (Reuters) - The two best performers among the Group of Seven economies in the third quarter almost certainly took separate paths in the fourth, as Britain suffered a Brexit reality check, while the United States sailed on despite the trade war it has sparked. The world’s largest economy is expected to have grown by an annualized 2.6 percent in the final three months of 2018. Even if that is down from the 3.4 percent of the third quarter, it is still a healthy clip. A first estimate should have been released by now, but the U.S. Bureau of Economic Analysis said on Thursday the release had been pushed back to Feb. 28 due to the government shutdown. Forecasts though equate to a quarterly 0.6 percent, triple the growth rate of the euro zone in the same period. Growth in China, while far higher, cooled to a 28-year low in 2018. Japan, the world’s third largest economy has yo-yoed between contraction and expansion throughout the year, with a 0.4 percent growth reading seen for Thursday. Harm Bandholz, chief U.S. economist at UniCredit, says that despite unstable politics in Washington, two factors explain why the U.S. economy is one of very few holding up well in recent months - massive stimulus mainly from tax cuts and the fact that it is relatively closed and not dependent on foreign trade. In the very short term, the government shutdown, which could resume next Friday, and the polar vortex of late January could rein in first quarter expansion. Longer term though, even the Federal Reserve has become more hesitant, signaling last month at least a pause to its monetary policy tightening due to a cloudier outlook and growing risks. The labor market is still glowing, but the impact of tax cuts will fade and the nation will hit a debt ceiling in March, which could ultimately lead to a debt default. UniCredit’s Bandholz says slower growth could expose the very high debt of corporates, weakening investment spending and possibly spilling over into other parts of the economy. “All these factors combined will be enough to push the U.S. economy into a mild recession in 2020,” he said. For now, U.S. strength in the face of economic slowdowns elsewhere may well be helping President Donald Trump’s trade push. Trump said on Thursday he did not plan to meet Chinese President Xi Jinping before a March 1 deadline set by the two countries to achieve a trade deal. Other countries, notably Germany, are awaiting a Commerce Department report due Feb. 17 on whether auto imports are security risk. Bank of America Merrill Lynch wrote on Friday that this should not in the end lead to tariffs, although believes “some brinkmanship” is likely. Across the Atlantic, Britain enjoyed its fastest economic upturn since late 2016 during the third quarter, spurred by a surge in consumer spending over an exceptionally hot summer and England’s surprise passage to the semi-final of the soccer World Cup. However, fourth quarter growth is seen at only half that 0.6 percent rate. The Bank of England said on Thursday Britain faces its weakest economic growth in a decade this year as “the fog of Brexit” causes tension and the global economy slows. It follows Tuesday’s release of the IHS Markit/CIPS UK Services Purchasing Managers’ Index (PMI), which fell to its lowest since July 2016, showing the world’s fifth largest economy stalling or contracting, with firms in services reporting jobs cuts for the first time in six years. James Smith, economist at ING in London, said the British economy should normally mirror what was happening in the United States, partly because of its greater services base, but that had not been the case in 2018. “Sure, there’s a bit of a global element and on the manufacturing side, the fact that euro zone demand has slowed has had an impact, but really Brexit is the main story here,” he said. British Prime Minister Theresa May is due to report back to the UK parliament next week after securing at least a pledge of renewed talks from a day trip to Brussels. Parliament will then hold a debate on Thursday, which could see attempts to shift control of the process away from government and give parliament a chance to define Brexit. For the euro zone, the initial estimate on growth is already out, but the German figure is only due on Thursday, when data is expected to show Europe’s largest economy narrowly avoided a technical recession by eking out 0.1 percent growth in Q4. Euro zone industrial production figures due the day before, on Wednesday, will also be watched closely by markets keen to know the depth of the region’s decline. Edited by McCarthy, 09 February 2019 - 22:15. Here are four charts that look at key aspects of the US and Eurozone economies: swap spreads, industrial production, equity prices, and exchange rates. The financial fundamentals of the US economy are sound: systemic risk is low and liquidity is abundant. Eurozone yields are low because growth and opportunity are in very scarce supply. The current strength of the dollar is largely driven not by tight money or higher interest rates, but by the fact that the US economy is simply a much more attractive place for capital. Here are four charts that look at key aspects of the US and Eurozone economies: swap spreads, industrial production, equity prices, and exchange rates. By now everyone knows that the Eurozone has its problems, especially with the UK's bumbling attempt to exit the Eurozone trade agreement, France's violent protests, Germany's struggle to assimilate millions of Muslim immigrants, and Italy's refusal to address its fiscal deficit. But if you think things are bad in the US, you've been reading too much fake news. 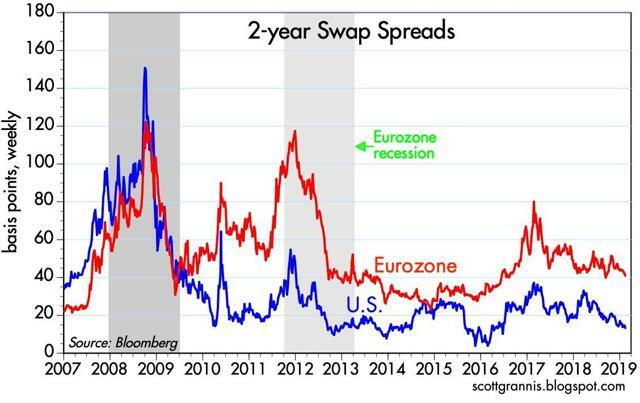 Note in particular how Eurozone swap spreads began to surge in the first half of 2011, some 3-6 months before a recession hit, and how they began to decline well in advance of the end of the Eurozone recession. This is yet more proof that swap spreads can be excellent leading indicators of economic and financial market health. I have more background on swap spreads here, and numerous charts on swap spreads over the years here. 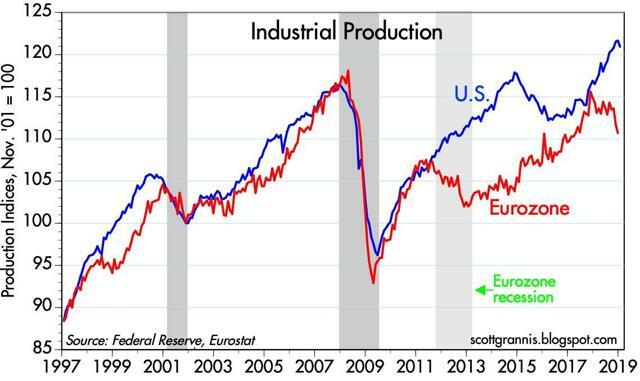 Chart #2 compares industrial production in the Eurozone and the US. Here we see how Eurozone industrial production declined throughout its 2011-2013 recession, whereas US industrial production kept rising and has now moved well ahead of the Eurozone. The recent decline in Eurozone industrial production hints strongly at a recession, but the Eurozone's relatively stable and only moderately elevated level of swap spreads argues against a Eurozone recession. 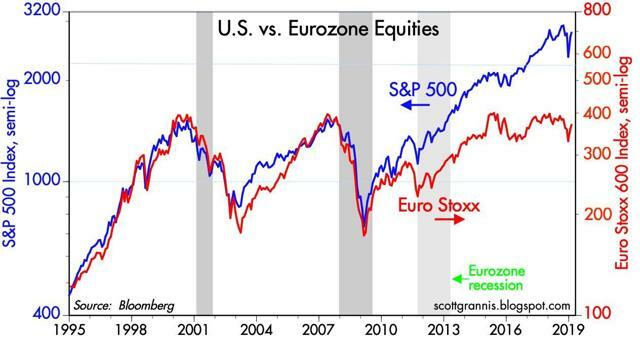 Chart #3 compares equity market performance in the US and Eurozone. Note how both markets suffered a setback in the run-up to the Eurozone's 2011-2013 recession, then proceeded to rally throughout the course of the recession. Equity markets can indeed be leading indicators of economic troubles, but not always. In any event, the industrial side of the US economy has zoomed far ahead of its Eurozone counterpart over the past decade. The US is, by this measure, the most dynamic of the advanced economies on the planet. Chart #4 compares the value of the Euro/Dollar exchange rate to my calculation of the Purchasing Power Parity of the Euro. (The PPP value of one currency versus another is driven by changes in relative inflation, and in theory, it is the rate which would make prices in both economies roughly equal. 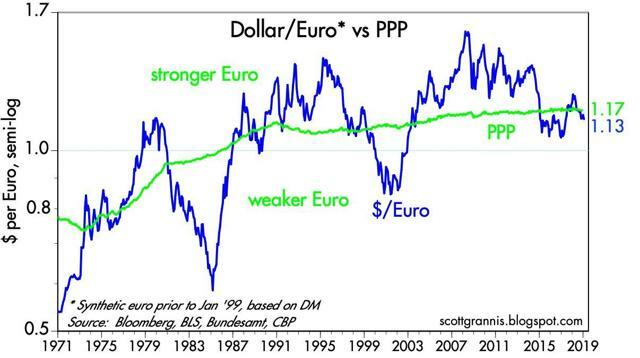 In this case, since Eurozone inflation has been lower than US inflation since 1995, the PPP value of the Euro has been slowly rising since 1995.) Over the past decade, as Eurozone industrial production has lagged US industrial production (and by inference the US economy has outperformed), the nominal value of the Euro has been falling, from a high of 1.60 to now 1.13. This supports my view that the current strength of the dollar is largely driven not by tight money or higher interest rates, but by the fact that the US economy is simply a much more attractive place for capital. Nick Kounis, head of financial markets research at ABN AMRO, points out that they have made downward revisions to their Eurozone GDP forecast for 2019 to 0.8% from 1.1% previously.